Dónal was in charge tonight, but unlike previous open mats, this was more regulated. Rather than just everybody heading off to do their own thing, Dónal ran us all through a series of drills first. This was in keeping with what he's been showing over at Hit Fit, practicing various backstep motions related to passing the guard (like in Black Belt Requirements). I don't think I'm remembering these in order, but the first one might have been where you're passing the guard, but they turn into you. Push on their knee, then replace that with your leg on their thigh, backstepping to move to the other side. They repeat the motion and you move back to where you started, re-initiating the loop. Same thing we did in a private a while ago. Another one, you're stood up, one hand on their hip, other hand into their same side knee. Push the knee away while still holding the hip so they can't shrimp out, then collapse onto them for side control. 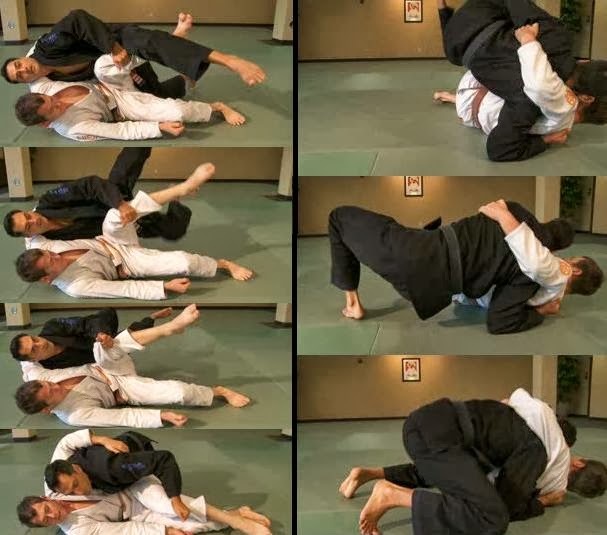 If they are lifting you up and about to land the butterfly sweep, on the side they are hooking and lifting, turn your hips in the exact same motion from the first drill. You can then backstep off their hook and end up going straight into side control. That's the same thing Roy Dean shows. The final option I can remember is where they are in butterfly guard, they have one knee raised. Bring your same side knee up and use it to push their knee down. Your opposite hand goes onto their knee, turning the hand so you can stiff-arm into the crook of their knee. That stiff arm stops them recovering their position, so you can pass to side control or maybe even get right to the back. The class was then split into drilling and sparring, so I naturally wanted to drill. My focus today was closed guard, particularly breaking their posture. I wanted to get them in the gi tail series, but if they resist and pull back, follow them and hit the sit-up sweep. With the gi tail, I think I'm relaxing the pressure on them too much so they can raise up. I could perhaps have a higher guard to bring my legs into it. I'm also not getting the gi tail deep enough when I initially pull it free, which means I don't have enough to grip properly. When I'm coming up for the sit-up sweep, I need to be aware of the angle to pull back on their elbow/tricep to knock out their posting arm. If I don't, then I am going against their strong point. Could be I'm not bringing my arm up properly as I go for the sweep, because I'm thinking too much about the follow up techniques. I finished off by playing around with various techniques from the Roy Dean DVD I recently reviewed, along with some baseball bat choke stuff (which I couldn't remember very well, so I must take another look at my notes from the private lesson on that).